We first dropped our collective jaws at the sight of the 2018 Kawasaki Z900RS Café when it was unveiled during the EICMA Milan Motorcycle Show in 2017. With no official word from Kawasaki USA, we weren’t positive the stunning Z900RS Café would be gracing us with its presence in the United States. We can now confirm that it’s coming to America and it’s sure to turn plenty of heads. Based directly upon the sporting Z900, the Z900RS satiated a more classic, casual riding experience, to fit with its vintage charm. The Z900RS Café pushes the envelope just a bit further. The Z900RS Café is certainly an attractive addition to Kawasaki’s Z family, but until we get some seat time with this new retro racer, we’ll hit you with the essential Fast Facts. 1. The 2018 Z900RS Café is an extension of the classy Z900RS. The Z900RS Café shares all critical components with the Z900RS. Its engine, chassis, adjustable suspension, and braking components remain the same, with a few alterations to the riding position, and styling. That’s good news, as we did enjoy the Z900RS quite a bit. Kawasaki has gone full-café in the same vein as the BMW R Nine T Racer, Moto Guzzi V7 Racer and the Triumph Thruxton. 2 Café style ergonomics will keep things feeling racy. The new RS Café will feature a slightly taller seat-height than its progenitor, coming in at 32.3 inches. Combined with lower, flatter handlebars, the Z900RS Café will offer a more sporting riding position, without pushing too far into the sport realm. 3. No Café racer is complete without a sporty front cowl, and the Z900RS Café delivers. I’ll admit, I’ve always been a sucker for the vintage race machines. The clean lines and minimalist bodywork are uniquely satisfying. Aside from the aesthetic touches, the windscreen could provide a bit more wind deflection, in conjunction with this more aggressive riding posture. 4. The two-tone lime-green paint scheme looks stellar. We know that our friends in the European and Australian markets will be seeing the Z900RS Café in a gray variant, but as far as we can tell, we’ll be seeing the Kawasaki lime-green version exclusively. 5. A punchy 948cc inline-four cylinder is at the heart of this Café racer. It is the very same stately motor that we enjoyed in the Z900RS, focused on giving torquey, useable power for the street. The Z900RS Café’s powerplant delivers a claimed 72 ft/lbs of torque at 6500 rpm—more than enough to keep any Café aficionado pleased when behind the bars. 6. The tuned exhaust gets a new finish. To match the Café motif, Kawasaki has given the Z900RS Café’s exhaust a brushed stainless steel finish, as opposed to the chrome finish on the Z900RS. It’s the same 4-into-1 tuned exhaust that Kawasaki specifically designed to have a thrilling exhaust note. 7. The 2018 Kawasaki Z900RS Café will be a more leisurely ride with higher overall gearing. Kawasaki is swapping out the 44-tooth rear sprocket on the Z900 for a 42-tooth sprocket for the Z900RS Café. This raises the overall gearing by 4.7 percent, so the engine speed will be down at equivalent velocities. That also means that acceleration should less aggressive than the standard Z900. 8. This retro-racer has the same wheelbase as the Z900RS. The Z900RS Café features a 57.9-inch wheelbase, just as the Z900RS. The change is due entirely to the smaller rear sprocket and the axle being placed farther back on the swingarm than the sporty Z900. So, in addition to more casual acceleration, the handling will also be a bit more sedate. 9. The Z900RS Café has classic looks, but modern safety technology. While its appearance might be something from the days of Eddie Lawson snatching titles aboard his KZ1000R, you can expect two-mode traction control and ABS to keep a watchful eye over you. 10. 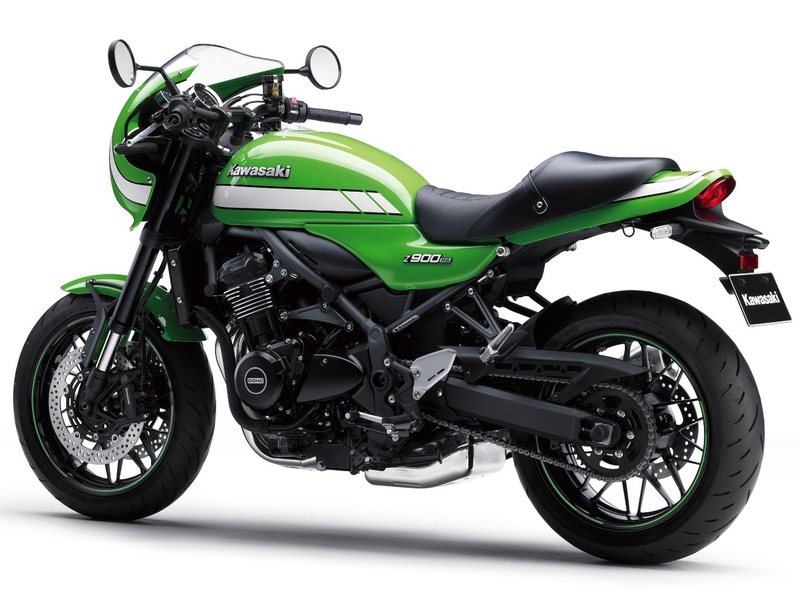 Kawasaki is producing the Z900RS Café in limited numbers. Kawasaki representatives haven’t stated just how many of these units will be coming stateside, but they’ve made it clear that this will not be a major production machine. If this tickles your fancy, stop by a dealer ASAP. 11. MSRP has been set at $11,499.00.